Today we did Spring like things. We planted two flats of flowers from the Farmer's Market, refilled the bird feeder, let Elliot & Josh splash in puddles with their rain boots, watched bees fly around the flowers and at the end of the day we played with the stomp rocket at a pocket park letting the gusty winds carry the foam rockets high up. One of Joshua's bottom teeth came out today! It's his first tooth to come out on its own. The first tooth he lost was due to a dentist who spotted an abscess root after he cracked a neighboring tooth from a fall in the bathroom. He first discovered this loose tooth on Wednesday or Thursday and by this morning it was hanging out practically horizontal when he pushed on it. Rusty made a quick run to the bank for a few gold dollar coins. I'll put one under his pillow tonight. I almost bought Rusty a really cool expensive birthday present. I was on the phone about to give my credit card number when a very quiet thought suggested he might not think it's all that. It's completely out of character for me to talk about or show a gift prior to the giving, but I made a rare exception this time. We drove to the store, the sales person showed him a picture, they talked, Rusty asked a lot of the same questions I had asked, then we left for him to ponder things over. After a day of thinking, he decided it wasn't all that. So instead of a high-key birthday, we'll settle instead on a low-key birthday. I'll try to get out work around lunch time so we can catch a movie or do some disc golfing or do something fun and special together. And on the topic of gifts, I have Mother's Day taken care and am just waiting to mail it out. Which is also unusual. I'm rarely this ahead of schedule when it comes to mailing stuff. The black shirt pictures are from Easter before we dyed eggs. Today was a most excellent day. I've got my work caught up at work, Easter plans are coming together, and the new car is totally awesome. 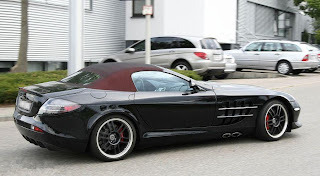 That's right new beautiful shiny fast Brabus Mercedes McLaren SLR Roadster with it's cushy red interior, front spoiler and V8 compressor. It goes deliriously fast and has super-awesome doors that open upward, not out. We had been talking about a new car for the fun of it and this week we decided we finally could afford it and really wanted it. So what of my Mazda? It's parked in the front now, exposed to the harsh elements and dangers of street life while our new beau is making everything in our garage look blah. This car is no kids allowed so we'll only drive it on dates and special occasions. And now we're back to being broke but hey- we can drive fast! Our patio is finally refinished- yay! I thought the guy would never finish. Due to bad weather that project has dragged on for weeks. The contractor was real pleasant to work with though. He offered, half-jokingly, to watch our kids last week so today we decided to take him up on his offer. He's working on some ladies gutters and a neighbor's kitchen tile tomorrow then he'll come by to watch our kiddos while we catch a movie. I feel real confident he'll do a good job. I haven't met him much beyond a few hellos and updates about our patio, but I figure his dad-like instincts will kick in. He doesn't have kids or even a girlfriend so he's not constrained to a schedule. I thought about doing a background check and asking for referrals, but I'm worried that will seem rude so I'm just going with good vibes. Last bit of insight: I read on the internet recently about alternative fertilizers in an attempt to save a bit of cash and be more eco-friendly. I read that human excrement brewed with food (like the stuff you'd put into your compost) is actually extremely nutritious for the plants. I've requested HOA approval to use this method of fertilization on our yard. The first test batch I brewed did smell pretty bad but it also left a noticeably greener patch of grass. It also attracts insects which help aerate the ground and provides a habitat for them. The first I brewed contained a week's worth of pee, several bowel movements from all of us, and about 3 pounds of food waste. You brew it in a large pot, cool it, then spread it evenly. I totally recommend it!